Members of the Broadway Industry convened at the Whitby Hotel in Manhattan November 27th for a roundtable discussion, hosted by AKA NYC, on the importance of brand experience and experiential marketing. L-R Amanda Blackman, AKA NYC SVP; Jeffrey Swierk, Mastercard; Zach Overton, Samsung Electronics America and Dan Hanover, Event Marketer. Today’s consumers don’t want to be advertised to, they want to be engaged with. Brand experience is therefore essential. 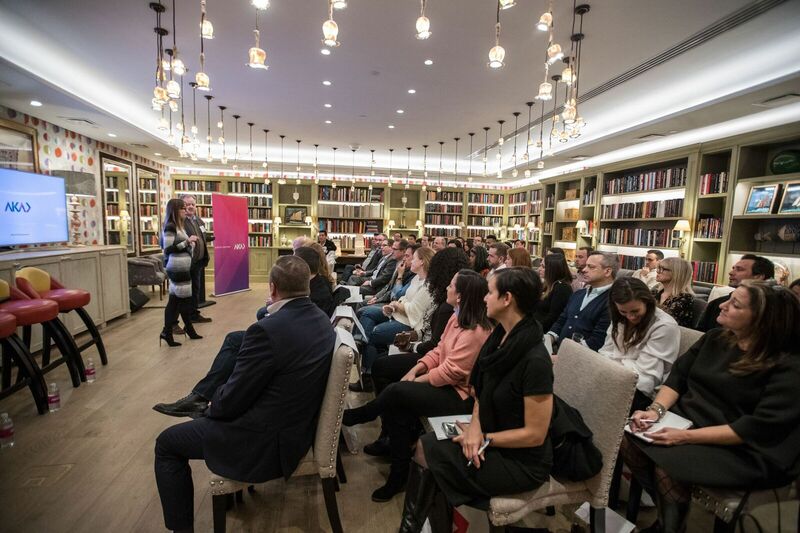 Members of the Broadway Industry convened at the Whitby Hotel in Manhattan November 27th for a roundtable discussion, hosted by AKA NYC, on the importance of brand experience and experiential marketing. Founding editor-in-chief of Event Marketer and author Dan Hanover (Experiential Marketing: Secrets, Strategies, and Success Stories from the World's Greatest Brands) headlined the event. He was joined by experiential marketers Jeffrey Swierk, North American Sponsorship at Mastercard; and Zach Overton, Vice President of Customer Experience and General Manager, 837, Samsung Electronics America, in a lively discussion, moderated by Amanda Blackman, AKA NYC SVP, Creative Strategy and Experiential Design. AKA NYC is the world’s only theater and arts agency focused on brand experience. The global agency creates award-winning, consumer-led campaigns that incite action and sell tickets. Led by Elizabeth Furze & Scott Moore, AKA NYC works channel-agnostically, building experiences online, offline, and everywhere in between. Current and recent NYC clients include: Anastasia, The Band’s Visit, Big Apple Circus, A Bronx Tale, Charlie and the Chocolate Factory, Come From Away, Empire Outlets, Harry Potter and the Cursed Child, John Leguizamo’s Latin History for Morons, M. Butterfly, Miss Saigon, Manhattan Theatre Club, New York Botanical Gardens, New York Wheel and Once on this Island. For more information, visit http://aka.nyc. Mastercard, http://www.mastercard.com, is a technology company in the global payments industry. Mastercard operates the world’s fastest payments processing network, connecting consumers, financial institutions, merchants, governments and businesses in more than 210 countries and territories. Mastercard products and solutions make everyday commerce activities – such as shopping, traveling, running a business and managing finances – easier, more secure and more efficient for everyone. Follow us on Twitter @MastercardNews, join the discussion on the Beyond the Transaction Blog and subscribe for the latest news on the Engagement Bureau. Located at 837 Washington Street in New York City’s Meatpacking District, Samsung 837 is the first of its kind technology and cultural destination for consumers, creators, tech enthusiasts and community members. A physical manifestation of the Samsung Brand, 837 is a flagship experience center at the convergence of humanity and technology that underscores how Samsung’s full portfolio of signature services and technology – ranging from mobile devices to home appliances – can make your life better. AKA NYC Managing Partners Elizabeth Furze and Scott Moore address the room.AKA NYC Managing Partners Elizabeth Furze and Scott Moore address the room.